Before we enter the geological records of two specific groups of extinct animals, it is worthwhile to consider the full history of the earth as it is known at the moment and given in the textbooks (fig. 66). Fig. 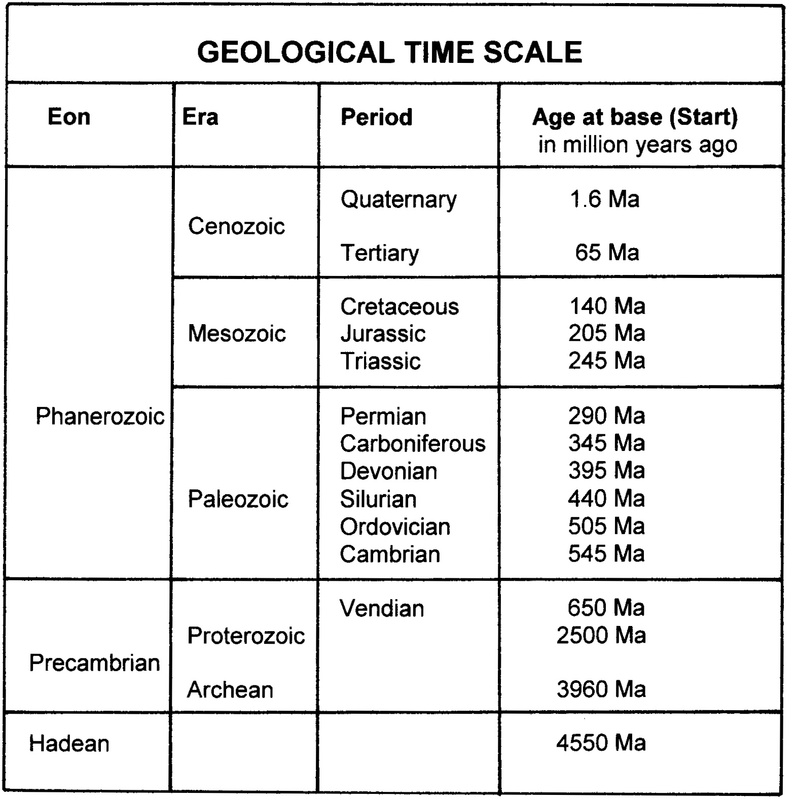 66 – The geological time scale, as divided in eons, eras and periods, is a compilation. The sequence and the (sub)divisions are the result of a comparison of information derived from rock sequences all over the world. The formation of the timescale is an example of the analogy method, which yields results of its own. The history of the earth is usually presented in a linear fashion, as a development from a barren and inhabitable planet some 4.5 billion years ago towards the lush and populated place it is today. The quadralectic aim will be to place this story in a cyclic context. The present is, in that view, not the end of a steady development, but just a stage in a visibility curve. The determination of the area of visible visibility (X) of two extinct groups (Trilobites and Ammonites) in the geological history is a matter of practical observation in the field: fossils are preserved in the rocks and act like the business cards of a salesman. They tell – to some extend – the story of a presence in place and time. Animals are called ‘extinct’ if no living forms of the genera are known within the time-presence of the observer. However, the animal appears as a given object within view and is not completely invisible. In the peculiar shape of a given rock (fossil) lies the remembrance of an animal, which was once alive. The form gets involved in a history-making process by a comparison between its initial environment and the present circumstances. The way of a ‘thing’ to find its place in history is highly dependent on the (division) context in which it is placed. The dual framework uses the formal parameters ‘present’ or ‘not present’. The nature of an observation is decided by the observed (the fossil), and not by the observer. Any legitimate scientific statement insists on objectivity and can only be arrived at from an observable presence. Any personal interpretation of the observer should be left out of the picture. This idealistic goal can – unfortunately – only be achieved in the lower forms of division thinking. The quadralectic approach takes a wider look. It aims at a (re) construction of the boundaries of empirical visibility within the course of a communication. The presence or non-presence – at a certain time and place – of an observable entity is placed in the context of a universal communication (as given in the CF-graph). The moment and setting (of the interaction between the observer and the observed) is a historical event, which cannot be ignored. Every given fact, which is used in a quadralectic context, should be stated with a clear reference to the credentials of the observer in terms of his or her type of division-thinking. This means, in practice, that any investigation (on a quadralectic level) should be accompanied by an explicit mentioning of the selective notions, which have been employed in the process of description and interpretation. No scientific work (in the realm of higher division thinking) can be complete without the indication of these chosen boundaries. The establishment of limitations in the case of fossils like Trilobites and Ammonites is fairly straightforward, at least on the level of a class (Trilobita) or subclass (Ammonoidea). Both consist of genera and species, which are known as index fossils, i.e. widely distributed fossils with a limited time span, which helps the dating of other fossils found in the same rock layer and pinpoint the position of a certain sedimentary deposit in time. 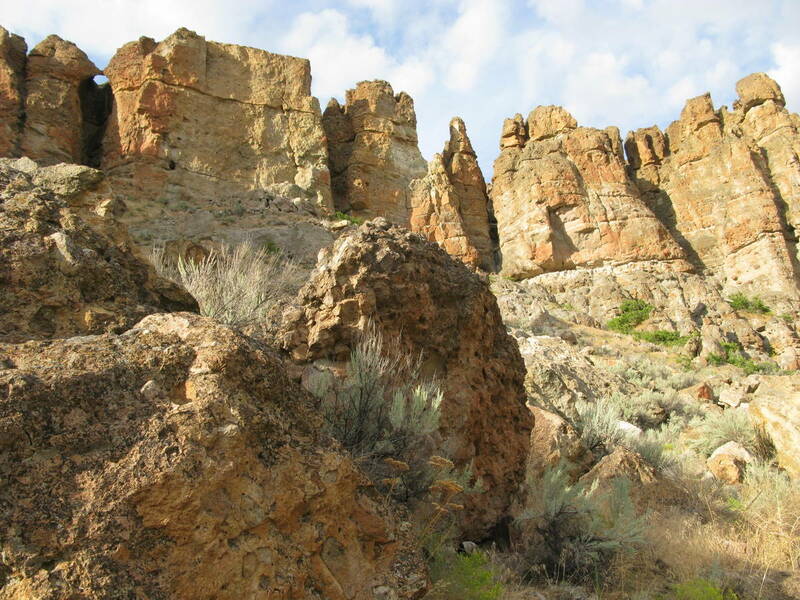 Eocene rocks in John Day National Park, Oregon (USA) (Photo: Marten Kuilman, 2010). 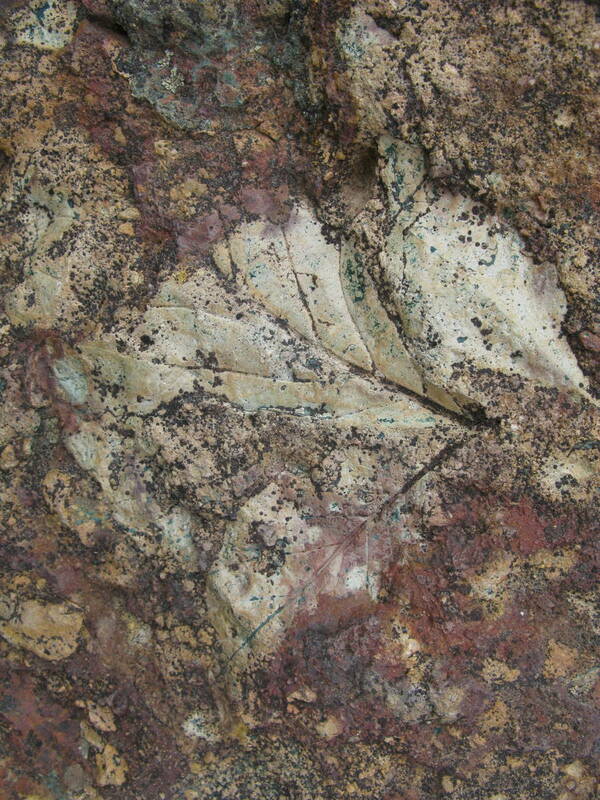 Fossilized leaves in John Day National Monument, Clarno Unit (Oregon, USA). Forty-four million years ago a series of volcanic mudflows, swept up a (tropical) forest and preserved a diverse assortment of plants and animals. (Photo: Marten Kuilman, 2011). The stratigraphic correlation with index fossils is a good example of modern analogy-thinking. The fossils are initially qualified as time-markers between rocks. Next they are used in the age determination of other rocks. This seemingly ‘circular argument’ represents a quadralectic shift over the communication trajectory. The comparison of analog information effects in dynamic values, which indicate the distance of the communication partners.